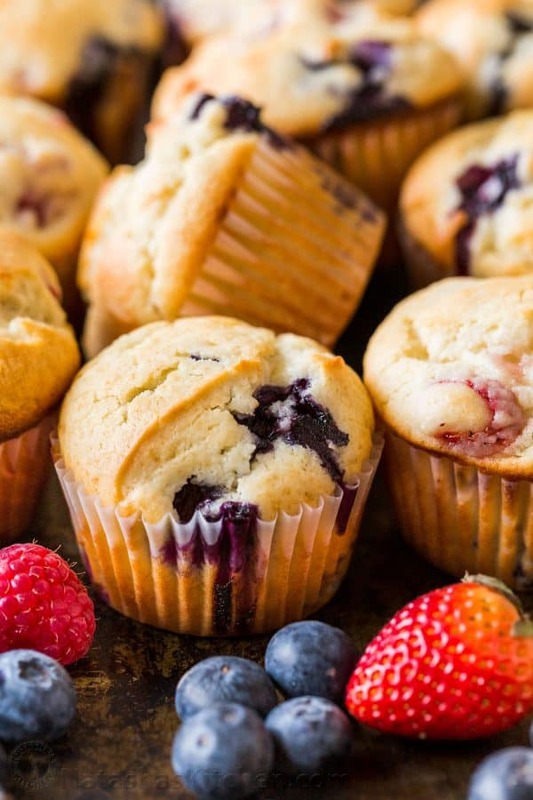 You will want to wake up for these fluffy Mixed Berry Muffins! 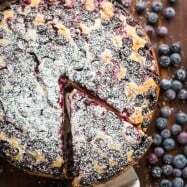 They come together quickly and are bursting with juicy strawberries, raspberries and blueberries. 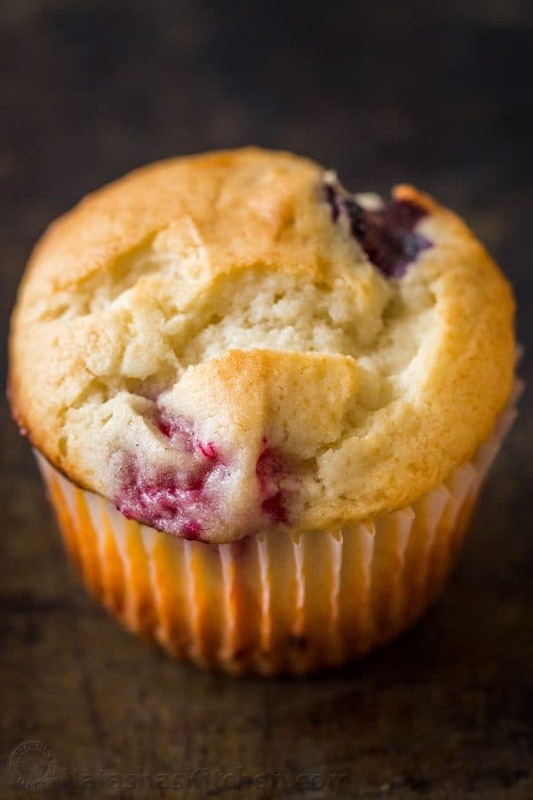 Muffins are the perfect grab-and-go breakfast or sweet treat like our popular blueberry muffins, soft apple banana muffins or breakfast egg muffins. Who can resist a warm homemade muffin? These triple berry muffins are made with Greek yogurt which makes them healthier with the added protein. If you don’t have Greek yogurt, sour cream will work equally well. Either way, the muffins turn out soft, fluffy, moist and tasty. 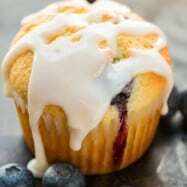 Can I use Frozen Berries for Muffins? 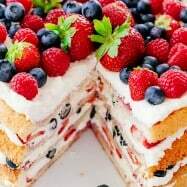 Fresh berries are ideal and if you can only find 1 type of berry, you can use 1 1/2 cups of a single berry i.e. 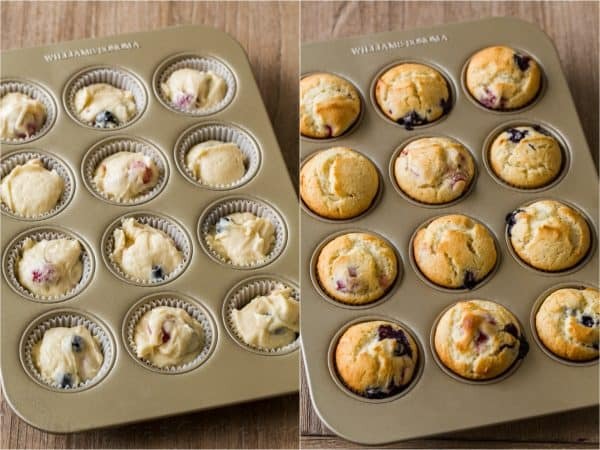 strawberry muffins or raspberry muffins. 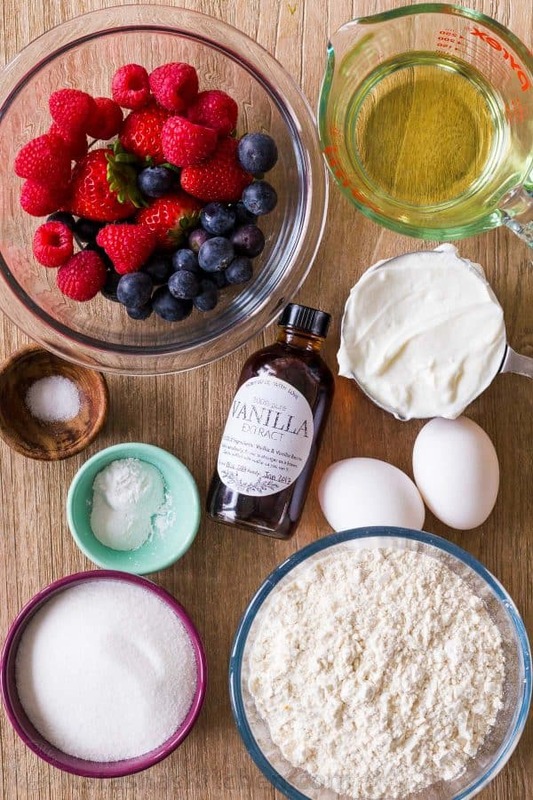 Roll Frozen berries lightly in a small bowl of flour and add them to the batter. 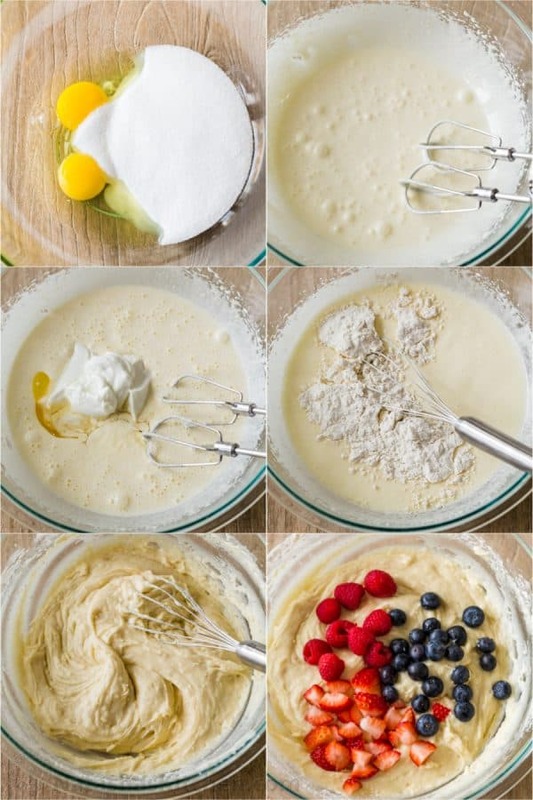 Fold frozen berries into the batter just enough to incorporate and stop mixing when you start seeing streaks of color. 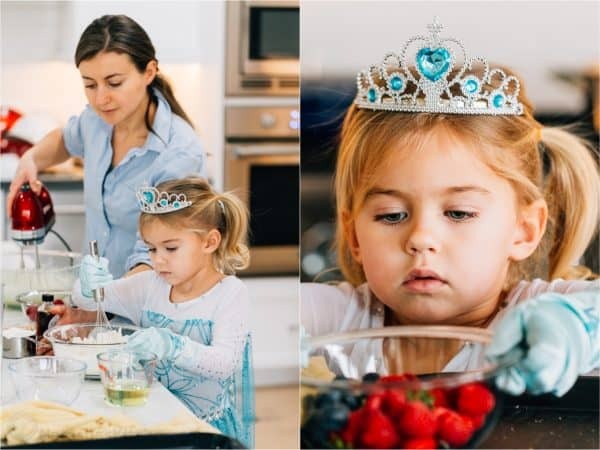 Over-mixing with frozen berries will cause your muffins to be greenish-blue or pink. 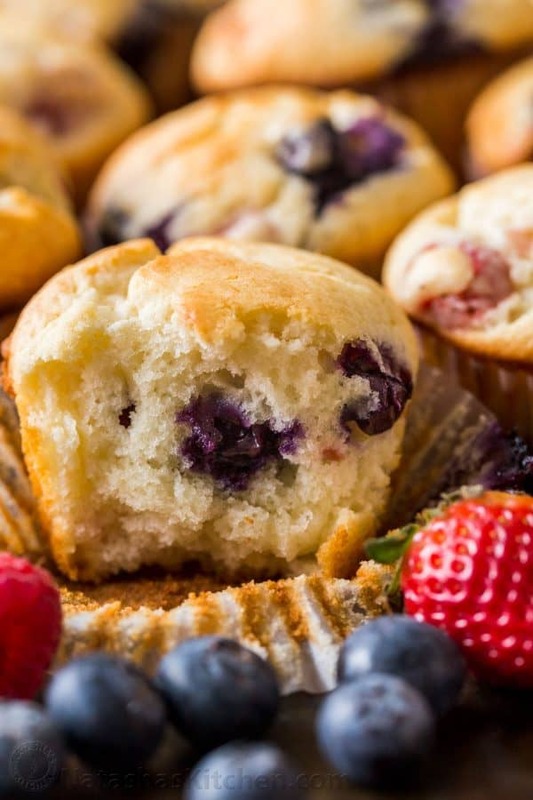 Why do berries sink to the bottom of muffins? 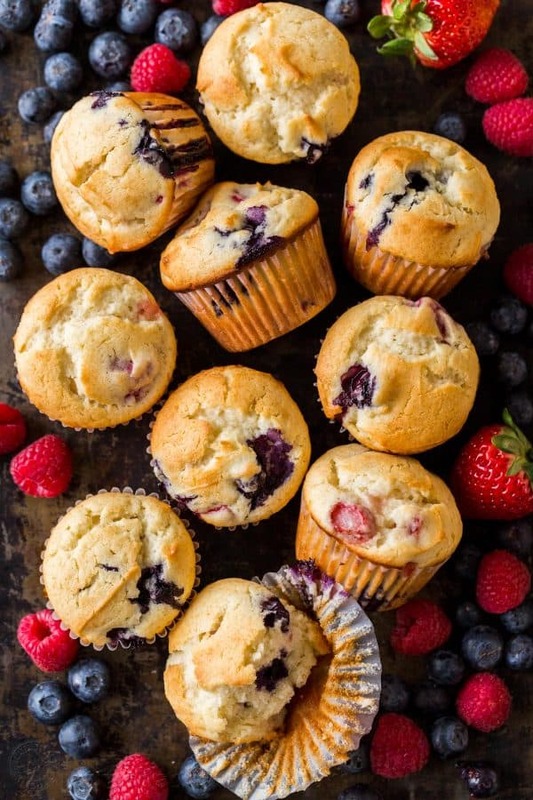 Berries will sink in muffins or cakes due to loose batter. They can also sink if using too much berries as the weight will pull them down. If you’re questioning if you can add fruit to a cake batter and the batter is too thin, it’s probably a bad idea. 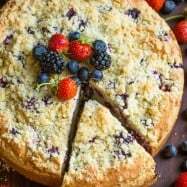 The batter in this recipe is thick so berries will stay evenly distributed without sinking to the bottom. 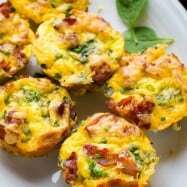 Homemade muffins is easy peasy and following this method produces super soft and moist muffins with a perfect muffin top. If you love your muffins glazed, this lemon glaze is a must try! Strawberry Pretzel “Salad” is an easy, potluck favorite! 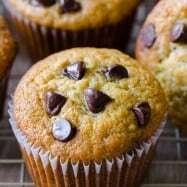 I’d love to try these muffins. Can I use canola oil instead of the olive oil?